The splash screen is the picture that you can see while Linux is booting. 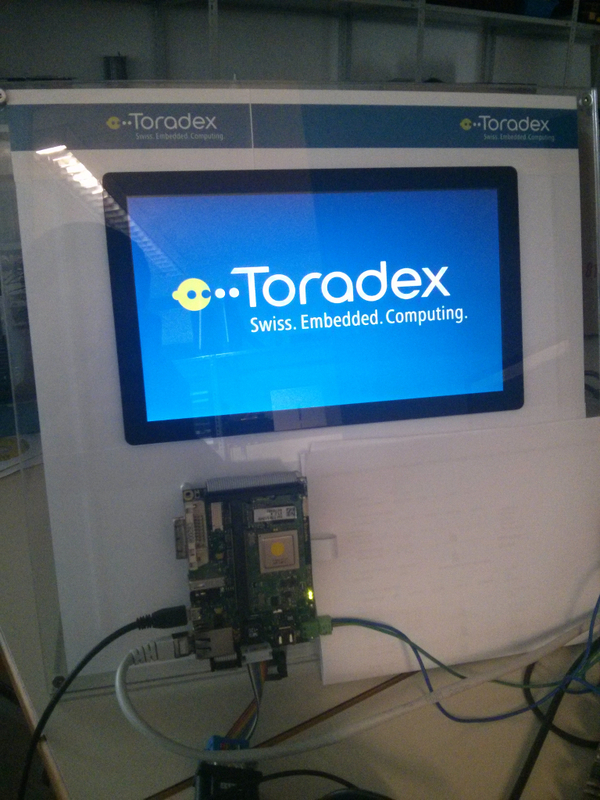 By default Toradex images display our logo. Create a new image with Gimp fitting the size of your display. In my case I will create an image for the capacitive 10 inch display with a resolution of 1024x600. Please check the Display Output, Resolution and Timings (Linux) article for more information about resolutions. Configure the desired Width x Height and click OK. Draw whatever is desired on the newly created canvas. File -> Export As.. Change the name to ppm format like "toradexlogo_1024x600.ppm". Choose RAW format and click Export. The file really needs to be in ppm format even though above dialog may actually be named PNM! $ find . -name "*toradexlogo*.ppm"
To get the source code, toolchain and the instructions how to build a custom kernel, follow the Build U-Boot and Linux Kernel from Source Code article. Basically you have to download the toolchain and the correct Linux kernel from the Toradex git server. Rename the ASCII file to "logo_custom_clut224.ppm" and copy to the folder "drivers/video/logo" located in the kernel directory. In menuconfig, go to: Device Drivers -> Graphics support -> Bootup logo -> Select just "Custom 224-color Linux logo". Compile the kernel image according to the article quoted above. Enter the U-Boot console by pressing any key while powering the board. Erasing at 0x9c0000 -- 100% complete. Note: Make sure consoleblank is kept at its default of 0 aka zero as otherwise it will blank the framebuffer after the configured amount of seconds.